I'm sure at this point, some or most of you might know that Jill Stuart is quite often worn by the celebrities in South Korea. Last season, actress Han Chae Young (한채영) and Lee Yeon Hee (이연희) was also invited to their Spring/Summer 2011 runway show. Recently, we saw Kim Tae Hee (김태희) and Seo Hyun Jin (서현진) wearing Jill Stuart. But there weren't any Korean celebrities on the front row this season. 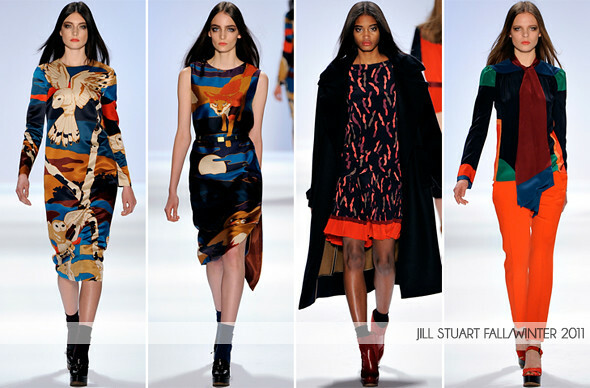 So my fingers are crossed for the next celebrity to wear Jill Stuart's Fall/Winter 2011 collection which I adore. The highlight of the entire collection was definitely the owl and foxes' prints. Jill Stuart was inspired by Heidi Specker's Black Forest photographs in Germany. The colors matched perfectly. Model Lindsey Wixson's bright red dress is definitely a show stopper. The metallic dresses were also my favorites of the collection. Topping it off with bright orange lip color and tassled high heel loafers which seems to be the "IT" show this Fall (also seen on Alexander Wang and Lela Rose.